The economy needs a shot of public investment--and if it's green, the payoff will be greatest. The collapse on Wall Street is now decimating Main Street, Ocean Parkway, Mountain View Drive and I-80. Since January the economy has shed 760,000 jobs. In September alone, monthly mass layoff claims for unemployment insurance jumped by 34 percent. General Electric, General Motors, Chrysler, Yahoo! and Xerox have all announced major layoffs, along with the humbled financial titans Goldman Sachs and Bank of America. Fully one-quarter of all businesses in the United States are planning to cut payroll over the next year. State governments are facing a tax revenue shortfall of roughly $100 billion in the next fiscal year, 15 percent of their overall budgets. Because states have rules requiring balanced budgets, they are staring at major budget cuts and layoffs. The fact that the economy’s overall gross domestic product (GDP) shrank between July and September–the first such decline since the September 2001 terrorist attacks–only confirms the realities on the ground facing workers, households, businesses and the public sector. The recession is certainly here, so the question now is how to diminish its length and severity. A large-scale federal government stimulus program is the only action that can possibly do the job. So far, our leaders in Washington have dithered. Treasury Secretary Henry Paulson and Federal Reserve chair Ben Bernanke continue improvising with financial rescue plans, committing eye-popping sums of money in the process. Paulson’s original program for the Treasury to commit $700 billion in taxpayers’ money to purchase “toxic” loans–the mortgage-backed securities held by the private banks that are in default or arrears–was at least partially shelved in favor of direct government purchases of major ownership stakes in the banks. But neither of Paulson’s strategies has thus far helped to stabilize the situation, with global stock and currency markets gyrating wildly and investors dumping risky business loans in favor of safe Treasury bonds. The crisis has even hit the previously staid world of money market mutual funds, where the fainthearted once could park their savings safely in exchange for low returns. Money market fund holders have been panic-selling since mid-September, dumping $500 billion worth of these accounts. To stanch a money market fund collapse, Bernanke announced on October 21 that, on top of the Paulson bailout plan, the Fed stands ready to purchase $540 billion in certificates of deposit and private business loans from the money market funds. This action is in addition to two previous initiatives committing the Fed to buy up, as needed, business loans from failing banks. Until this crisis, the Fed had conducted monetary policy almost exclusively through the purchase and sale of Treasury bonds, rarely buying directly the debts of private businesses or banks. But the pre-crisis rules of monetary policy are out the window. Even if some combination of Treasury and Federal Reserve actions begins to stabilize financial markets in the coming weeks, this will not, by itself, reverse the deepening crisis in the nonfinancial economy. A rise in unemployment in the range of 8 to 9 percent–upward of 14 million people without work–is becoming an increasingly likely scenario over the next year. President-elect Obama as well as most members of the newly elected Democratic-controlled Congress seem to recognize the urgency of such a large-scale stimulus program above and beyond any financial bailout program. Even Bernanke, whose term of office continues through January 2010, has offered his endorsement. But despite the near consensus, questions remain, including: How should the stimulus funds be spent? How large does the stimulus need to be? Where do we find the money to pay for it? Recessions create widespread human suffering. Minimizing the suffering has to be the top priority in fighting the recession. This means expanding unemployment benefits and food stamps to counteract the income losses of unemployed workers and the poor. By stabilizing the pocketbooks of distressed households, these measures also help people pay their mortgages and pump money into consumer markets. Beyond this, the stimulus program should be designed to meet three additional criteria. First, we have to generate the largest possible employment boost for a given level of new government spending. Second, the spending targets should be in areas that strengthen the economy in the long run, not just through a short-term money injection. And finally, despite the recession, we do not have the luxury of delaying the fight against global warming. To further all these goals we need a green public-investment stimulus. It would defend state-level health and education projects against budget cuts; finance long-delayed upgrades for our roads, bridges, railroads and water management systems; and underwrite investments in energy efficiency–including building retrofits and public transportation–as well as new wind, solar, geothermal and biomass technologies. This kind of stimulus would generate many more jobs–eighteen per $1 million in spending–than would programs to increase spending on the military and the oil industry (i.e., new military surges in Iraq or Afghanistan combined with “Drill, baby, drill”), which would generate only about 7.5 jobs for every $1 million spent. There are two reasons for the green program’s advantage. The first factor is higher “labor intensity” of spending–that is, more money is being spent on hiring people and less on machines, supplies and consuming energy. This becomes obvious if we imagine hiring teachers, nurses and bus drivers versus drilling for oil off the coasts of Florida, California and Alaska. The second factor is the “domestic content” of spending–how much money is staying within the US economy, as opposed to buying imports or spending abroad. When we build a bridge in Minneapolis, upgrade the levee system in New Orleans or retrofit public buildings and private homes to raise their energy efficiency, virtually every dollar is spent within our economy. By contrast, only 80 cents of every dollar spent in the oil industry remains in the United States. The figure is still lower with the military budget. What about another round of across-the-board tax rebates, such as the program the Bush administration and the Democratic Congress implemented in April? A case could be made for this in light of the financial stresses middle-class families are facing. However, even if we assume that the middle-class households will spend all the money refunded to them, the net increase in employment will be about fourteen jobs per $1 million spent–about 20 percent less than the green public-investment program (the main reason for this weaker impact is the lower domestic content of average household consumption). Also, it isn’t likely that the households would spend all their rebate money. Just as with April’s rebate program, households would channel a large share of the money into paying off debts. This is no time to be timid. The stimulus program last April totaled $150 billion, including $100 billion in household rebates and the rest in business tax breaks. This initiative did encourage some job growth, though as we have seen, the impact would have been larger had the same money been channeled toward a green public-investment stimulus. But any job benefits were negated by the countervailing forces of the collapsed housing bubble, the financial crisis and the spike in oil prices. The resulting recession is now before us. This argues for a significantly larger stimulus than the one enacted in April. But how much larger? One way to approach the question is to consider the last time the economy faced a recession of similar severity, which was in 1980-82, during Ronald Reagan’s first term as president. In 1982 gross domestic product contracted by 1.9 percent, the most severe one-year drop in GDP since World War II. Unemployment rose to 9.7 percent that year, which was, again, the highest figure since the ’30s. The Reagan administration responded with a massive stimulus program, even though its alleged free-market devotees never acknowledged as much. They preferred calling their program of military expansion and tax cuts for the rich “supply-side economics.” Whatever the label, this combination generated an increase in the federal deficit of about two percentage points relative to the size of the economy at that time. In 1983 GDP rose sharply by 4.5 percent. In 1984 GDP growth accelerated to 7.2 percent, with Reagan declaring the return to “morning in America.” Unemployment fell back to 7.5 percent. In today’s economy, an economic stimulus equivalent to the 1983 Reagan program would amount to about $300 billion in spending–roughly double the size of April’s stimulus program, though in line with the high-end figures being proposed in Congress. A stimulus of this size could create nearly 6 million jobs, offsetting the job-shedding forces of the recession. 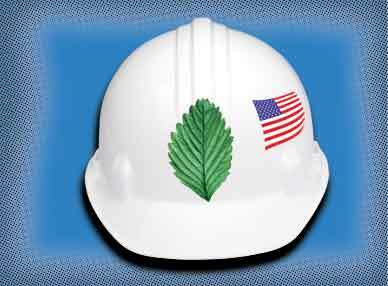 Of course, the green public-investment stimulus will be much more effective as a jobs program than the Reagan agenda of militarism and upper-income tax cuts. This suggests that an initiative costing somewhat less than $300 billion could be adequate to fight the job losses. But because the green public-investment stimulus is also designed to produce long-term benefits to the economy, there is little danger that we would spend too much. Since all these investments are needed to fight global warming and improve overall productivity, the sooner we move forward, the better. Moreover, under today’s weak job market conditions, we will not run short of qualified workers. How to Pay for All This? Let’s add up the figures I have tossed around. These include the $700 billion bank rescue operation being engineered by the Treasury, the $540 billion with which Fed chair Bernanke has pledged to bail out the money market mutual funds, along with unspecified additional billions to buy unwanted business debts held by banks. On top of these, I am proposing $300 billion for a second fiscal stimulus beyond last April’s $150 billion program. At a certain point, it is fair to wonder whether we are still dealing with real dollars as opposed to Monopoly money. In fact, the whole program remains within the realm of affordability, albeit approaching its upper bounds. But major adjustments from the current management approach are needed. In particular, the Federal Reserve has to continue exerting control over the Treasury on all bailout operations. That is, we need more initiatives like Bernanke’s $540 billion program to stabilize the money market mutual funds and less Treasury fumbling with taxpayers’ money to buy either the private banks’ bad assets or ownership shares in the banks. We need to recognize openly what has largely been an unspoken fact about these bailout operations: that the Federal Reserve has the power to create dollars at will, while the Treasury finances its operations either through tax revenues or borrowed funds (which means using taxpayer money at some later time to pay back its debts with interest). The Fed does not literally run printing presses when it decides to inject more money into the economy; but its normal activity of writing checks to private banks to buy the banks’ Treasury bonds amounts to the same thing. When the banks receive their checks from the Fed, they have more cash on hand than they did before they sold their Treasury bonds to the Fed. Especially during crises, there is no reason for the Fed to restrain itself from making good use (though of course not overuse) of this dollar-creating power. The Fed is also supposed to be the chief regulator of the financial system. Now is the time to make up for Alan Greenspan’s confessed failures over twenty years in this role. In exchange for the Fed protecting the private financial institutions from collapse, Bernanke must insist that the banks begin lending money again to support productive investments, while prohibiting them from yet another return to high-rolling speculation. Special measures are also needed to keep people in their homes. When the economy began slowing this year, the fiscal deficit more than doubled, from $162 billion to $389 billion. We cannot know for certain how much the deficit will expand. It could rise to $800 billion, $1 trillion or even somewhat higher, depending on how the bailout operations are managed. Of course, it would be utterly self-defeating for the United States to run a reckless fiscal policy, no matter how pressing the need to fight the financial crisis and recession. But in the current crisis conditions, even a $1 trillion deficit need not be reckless. Let’s return to the Reagan experience for perspective. In 1983 the Reagan deficits peaked at 6 percent of the economy’s GDP. With GDP now around $14.4 trillion, a $1 trillion deficit would represent about 7 percent of GDP, one percentage point higher than the 1983 figure. Of course, the global financial system has undergone dramatic changes since the 1980s, so direct comparisons with the Reagan deficits are not entirely valid. One change is that government debt is increasingly owned by foreign governments and private investors. This means that interest payments on that debt flow increasingly from the coffers of the Treasury to foreign owners of Treasury bonds. At the same time, as one feature of the crisis, Treasury bonds are, and will remain for some time, the safest and most desirable financial instrument in the global financial system. US and foreign investors are clamoring to purchase Treasuries as opposed to buying stocks, bonds issued by private companies or derivatives. This is pushing down the interest rates on Treasuries. For example, on October 15, 2007, a three-year Treasury bond paid out 4.25 percent in interest, whereas this past October 15, the interest payment had fallen to 1.9 percent. By contrast, a BAA corporate bond paid 6.6 percent in interest one year ago but has risen this year to 9 percent. As long as the private financial markets remain gripped by instability and fear, the Treasury will be able to borrow at negligible interest rates. Because of this, allowing the deficit to rise even as high as 7 percent of GDP does not represent a burden on the Treasury greater than what accompanied the Reagan deficits. administration can take decisive steps now to defend people’s livelihoods and to reconstruct a viable financial system, productive infrastructure and job market on the foundation of a clean-energy economy.